I set up a Twitter account long ago, but I have never used it. Today I decided to give it a chance, so if you are interested in following my short posts then go to http://twitter.com/rborry and subscribe. 1. I'll post when I learn or do something that could help others immediately. For example, last night I stayed in a 9th-floor suite overlooking Union Square at the Westin St. Francis in San Francisco. What is amazing, however, is that Yahoo Travel offered a package with the room and flight for only $60 more than the flight alone at Virgin America. This is an experiment, so please give me feedback on your experience with Twitter. When technology saves you time but does not help your work. I work from my home in Dallas, while my colleagues are spread in offices from San Francisco, Seattle, Sydney, Brisbane, and London. So I set up my work phone extension to forward to my home office phone, which is a virtual "softphone" from Skype, which will then forward to my cell phone if I don't answer on my laptop. Finally, my cell phone will collect a voice mail if I still do not answer, and it will email me that message in an attachment. At least that's how I thought it worked, until this week when a couple of people told me that they called and received a "Mailbox full" message, even though my cell phone mailbox is empty. I checked with our internal IT and found out that the number of rings my work line waited before going to voice mail was the same as the sum of the number of rings my home office and cell phone waited before recording a message. And so sometimes my work line would take a message, but it wasn't sending me an email since the system was upgraded, and I had no indicator light telling me that I have a message. In case you have a similarly disconnected life, after much trial-and-error I finally settled on using a Skype In subscription, a Freetalk wireless headset, and a Sprint data card. The quality has been acceptable for business use for the most part, and it keeps me connected anywhere I travel as long as I have Internet or cell phone access. Just be sure to check the forwarding settings every now and again. Think you'll never attend a meeting in a Virtual World? Look out behind you! I've heard meetings expert Corbin Ball speak for several years now about the coming era of Virtual Meetings in Second Life and similar sites. The typical audience response is something close to "not in my lifetime", but Corbin keeps plugging this vision. I may have been one of the skeptics in Corbin's presentations, but I've recently been converted by three experts in my own house. 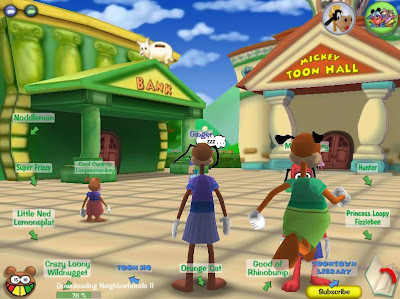 The other day I walked over to our computer table to see three of my kids (Kyra age 10, Cade age 9, Izzy age 6) excitedly switching screens and looking over each others' shoulders as they played a new game they discovered at Disney.com - Toontown. 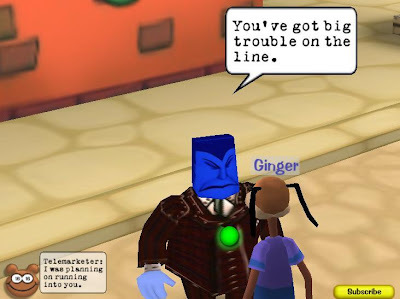 Basically, you pick a Disney character to represent yourself, and then you run around a virtual Disney world, talking to other kids' Toontown characters and trying to figure out how to defeat the evil Cogs infecting the world. To my kids, this environment was more natural than the pictures of real trade shows that I show them when they ask me why I went away last week. Their response is, "You stand in that tiny booth all day waiting for people to come see you?!?" There is Izzy above, using her dog's name "Ginger" for her Toon. Izzy talking to a Cog (they are bad). Izzy talking to a town employee for help. 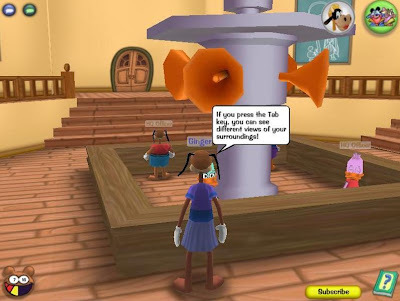 As the Toontown generation becomes the working class, the age of virtual trade shows is inevitable. Inc. magazine recently published an article ("Nice meeting your avatar") on three leading providers: InXpo, Unisfair, and ON24. I've also seen Digitell at the Meetings Tech Expo shows and have explored their version of Active Worlds platform. I tried the Active Worlds platform but found the experience lacking. There were too many key controls to move around, visiting booths took longer than I was willing to spend, and the booths were too cumbersome to customize (in my opinion). The experience was too close to reality - at a real show I don't mind walking across the floor for five minutes to find a booth, but I'm used to everything being instant at my computer. The systems will improve, however, and if it's in Inc. this month then it will be in Forbes next year and in Newsweek the year after that. By then you may have attended one yourself. If so, please let me know about your experience. Last week I attended the 2009 National Education Conference for SGMP in Louisville, Kentucky. Like all trade shows this year, attendance was down by nearly half, and of those about three times as many attendees were suppliers compared to buyers. The meetings world has not stopped, however, and I continue to meet customers who renew their licenses and new prospects who want to make their operations more efficient. Thursday morning, I spoke on "Online Registration for Government Meetings" with about 60 planners. Below are the slides that I presented.